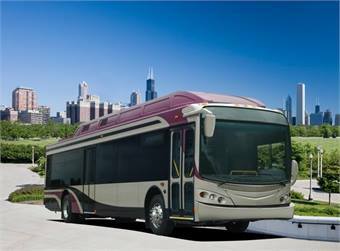 North American Bus Industries Inc. (NABI) is "Taking You Further" with the unveiling of its Gen III LFW products at EXPO Booth #3733. NABI's proven LFW platform has recently received a fresh, new front mask that incorporates modern and functional design cues, including a more raked windshield, latest headlight technology and an absorbing front bumper with integrated styling. LFW recently took on a fresh, new front mask. The new front mask incorporates modern and functional design cues including the latest headlight technology, an energy absorbing bumper with integrated styling, and a more raked windshield that's available in single-piece or two-piece configurations. The roof top equipment enclosure also benefits from fresh, new styling with more streamline front and rear end-fairings. As with earlier LFW's, this rooftop enclosure is used to conceal CNG tanks or hybrid energy storage equipment. But, don't let the LFW's modern good looks fool you. The body's entire structure, from its A-pillars to its rear-corner posts is the same proven, utilitarian structure that has been refined in transit applications for over a decade.